Gautami Heights is a 4 star luxury hotel in Kashipur which combines an exotic blend of the highest luxury of an ultra-modern hotel in Kashipur and the comforts and coziness of a sweet home. 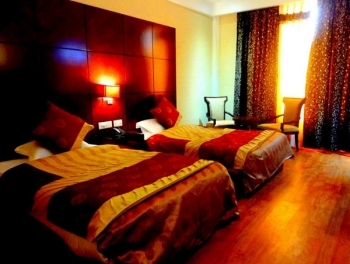 The hotel intend to provide the best services and facilities. The hotel is co-branded with Best Western Plus group of hotels. Our Hotel combines the convenience of all the facilities and amenities offered by an elegant hotel. 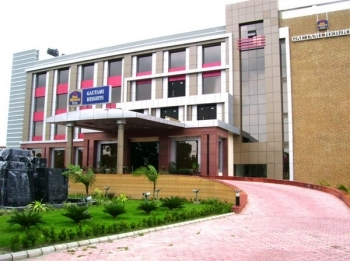 It is the ideal choice for your accommodation, business meetings and seminars in Kashipur. Gautam Heights hotel is located 3 kms from Rudrapur Road on NH4 on Bazpur Road in Kashipur. There are 36 rooms in Best Western Gautami Heights hotel with all the modern facilities and amenities to make your stay comfortable. Deluxe rooms: spread across three floors featuring plush decor with all modern ammenities. These rooms come with high class tiled flooring and large executive work desks providing full privacy. Super Deluxe rooms: have exclusive Floor dedicated to discerning Corporate and Business elite, Rooms are very spacious, featuring plush decor with high class tiled flooring & tiled finished bath rooms, large executive work desk. These rooms are furnished with a queen-size bed, suitable for single guest. The workspace constitutes a writing desk and chair. Suite room: The Suite is an exclusive floor offering the best for you, our discerning business clientele. There are 2 restaurants and bar in Guatami Heights hotel, which offers delicious multi cusines.